Last month I promised to write more about the Leonid meteor showers, which are scheduled to appear on our cosmic horizon on Tuesday, November 17. Astronomers call the Leonids “the most famous of the unreliable showers.” They’re named for the constellation Leo, where they appear to originate. In the night sky, Leo belongs in what H. A. Rey (of Curious George fame) in his classic star-gazing book, The Stars, named “Carnivore’s Corner.” Leo (the Lion) revolves around Ursa Major, the Great Bear, along with other hunting animals, the Little Bear, Lynx, Dragon, and Hunting Dogs. They follow the Great Bear into “hibernation” — out of easy viewing — during the fall and winter. The Leonids are called “unreliable” for meteorological reasons: They can’t be counted on for good viewing, even in what are supposed to be peak years. Part of what makes the Leonids unreliable is that their cosmic debris streams don’t hit the earth in a predictable pattern, and astronomers can’t tell with any certainty when the shower faucet is wide open — when the most meteors enter the earth’s atmosphere — or when it’s a slow trickle. In a logistical sense, the Leonids are an unreliable viewing experience because we can’t simply step out our front doors at bedtime and see the showers. Right now, Leo doesn’t appear in the night sky until around midnight, when the lion’s head pokes up over the eastern horizon line. Between midnight and dawn, the lion walks upside down around the rotating bear. The best viewing hours conflict, oh, only slightly with a good night’s sleep. However, at dawn, the constellation hangs in the middle of the sky, and this may be the most efficient choice for seeing the shower. 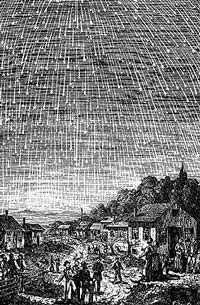 It was later established that major Leonid showers recurred at 33-year intervals, with a lesser annual shower that produces as few as 20 or 30 meteors an hour, and occasional “half-storm” events of around 500 meteors an hour at their peak. The Leonids orbit in a direction opposite to that of Earth. So the meteors slam into our atmosphere nearly head-on, resulting in extremely fast, very bright meteors, which leave long, luminous, green-tinted trails in their wake. We’re being told to check the sky three times for this year’s shower: before dawn on the morning of Tuesday, November 17, in case there’s unusual activity leading up to the peak; when the radiant passes the horizon, between 10 pm and midnight across North America; and in the hours before dawn on Wednesday, November 18. The moon is new, so we’ll have good viewing for whatever comes our way. The most recent major shower occurred in 1999, when observers saw 3,000 meteors an hour at the peak. The next major show won’t come our way until 2032, but astronomers are predicting that the 2009 showers may be similar to the “half-storm” showers of 1998, which became known for their spectacular horizon-grazing fireballs. If so, we may see 500 meteors in an hour — not enough to make us think the world is ending, perhaps, but enough not to mind a few hours of lost sleep. "Lessons from a missed meteor shower"